Beautiful certificate from the Showstar Entertainment Corporation issued in 2001. This historic document was printed by the American Banknote Company and has an ornate border around it with a vignette of the company's logo. This item has the printed signatures of the Company’s President, Barry Forward and Secretary, and is over 10 years old. 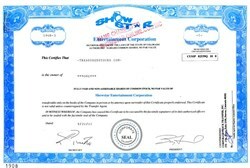 Showstar Online.com, Inc. was a developer of Internet websites and e-commerce solutions. The Company had established a unique and scalable e-commerce infrastructure by developing and integrating several leading edge technologies. Showstar would design each of its unique websites to provide information-enriched content that is directed at lucrative target market segments. The Company`s flagship website property was "Artstar.com," development of which commenced in May 1999. The Company launched e-commerce and retail activities on the website in December 1999 and thus commenced principal operations. A marketing and public relations program commenced in November 1999. Through the website, the Company offered a variety of products and services under the domain name "Artstar.com." These were designed to attract viewer traffic to the site and to generate revenue for the Company. The products and services offered included auctions, authentication and appraisal consulting, buyer (corporate and individual) representation, and education in art, collectibles and restoration.